"A Wind of Change for the European Youth Field"
This publication is intended for all organizations from the Western Balkans, which are hosting volunteers from EU countries within the framework of the programmes Erasmus+:Youth in Action and European Solidarity Corps, and are as such required to help them through the process of obtaining the residence permits for their stay during their volunteering period. The main aim of the survey was to explore the existing practices and identify the needs of the organizations to support the volunteer’s learning in the most effective way. The results of the survey are providing to MOVIT and SALTO SEE RC a basis for further investment in capacity building in this area. 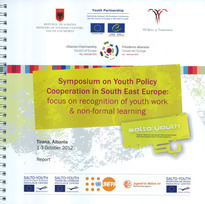 In the context of the Second Europe-Western Balkans Youth Meeting, held in May 2018 in Podgorica, SALTO SEE published some studies and articles that looked into the current state of youth work and youth policy in and with the Western Balkans. 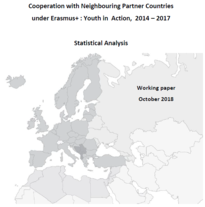 The statistics have been collected in October 2018 to give an overview over the development of the cooperation with the Neighbouring Partner regions (EECA & Russia, EuroMed, Western Balkans) in the Erasmus+ programme, youth field, during the period 2014 – 2017.The data aims to show developments and trends and, in addition, to provide a comparative view of the cooperation with the different regions. Report for the forum "Raise your voice for tomorrow's Europe"
The forum, which tool place in Ljubljana in November 2017, aimed at promoting the European dimension in education for democratic citizenship with young people, and contributing to the recognition of European citizenship. The final report provides an overview on the forum as well as the interesting debates held on the topics of young people, citizenship and Europe today! 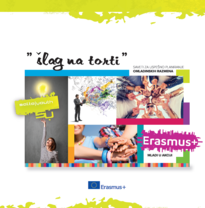 The brochure provides introductory information about the opportunities for cooperation within the Erasmus+: Youth in Action Programme for and with the Western Balkan region. 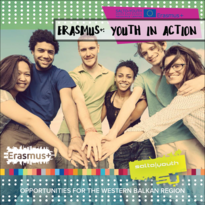 How can a Youth Exchange developed within Erasmus+: Youth in Action be used as a complementary element of youth work? This handbook explores all phases of Youth Exchanges and provides insights on what young people can learn in each phase, and how youth workers and youth leaders can facilitate the learning process. 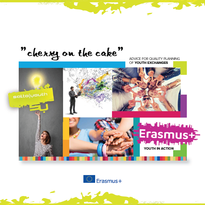 The publication "Cherry on the cake" -Advice for Quality Planning of Youth Exchanges is now available in Serbian language. The translation was made by the Tempus Foundation. The original version is available here. 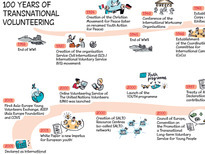 The poster illustrates milestones in the development of international and cross-boarder volunteering. It was produced in the context of the European Volunteering Forum in November 2016. 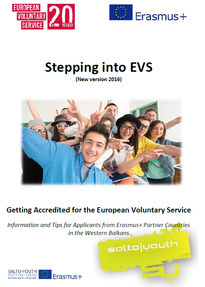 If your organisation is based in a Partner Country of Erasmus+ in the Western Balkans and wants to apply for accreditation as EVS receiving, sending or coordinating organisation, then this new guide Stepping into EVS (new version of 2016) is a must! This guide contains lots of information and tips on the content and process of the accreditation. 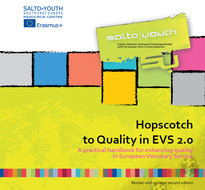 Would you like to know more about SALTO-YOUTH? In 2015 the network celebrated its 15th birthday. 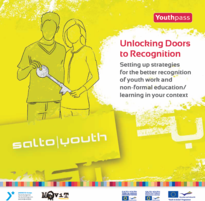 The publication "Looking forward, looking back: 15 years of Support, Advanced Learning and Training Opportunities" covers a range of expertise the SALTO Network offers to young people and youth workers all around Europe. 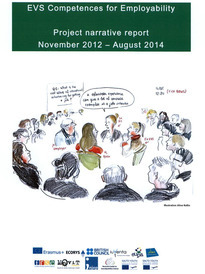 The articles prepared by the staff of all eight Resource Centres explore the past successes and challenges still to be overcome in the field of youth in Europe. 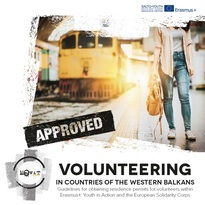 How do competences that volunteers gain through their European Voluntary Service (EVS) within the Youth in Action Programme (2007 - 2013) relate to employability? How are they perceived by EVS organisations, volunteers and employers? Here you can find the outcomes of a two year project on this topic. The Symposium on Recognition of Youth Work and Non-formal Learning in South East Europe, or the "Tirana symposium" continued the reflection, exchange of views and development of ideas on recognition of youth work and non-formal learning, this time focusing on the political developments in the countries of South East Europe. Describing the reflections and outcomes of the symposium, this report can serve as an inspiring tool for further work on this complex issue. Handbook with practical examples on how to set up strategies for better recognition of youth work and non-formal education in different contexts. 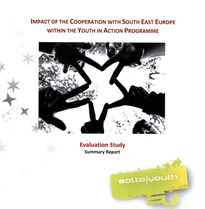 What has been the impact of the projects and partnerships developed with partners from the South East Europe within the Youth in Action programme (2007 - 2013)? This study looks at the impact on people, organisations, local communities, youth work and policy development. 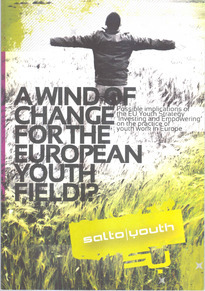 A joint publication of the SALTO YOUTH network based on the SALTO FireWork event, Paris, May 2010. Stuck for ideas on making the links between youth policy and practice? This publication can inspire you!